It takes a lot of moxie to call yourself a definitive classic. However, the subtitle of The Adult Learner is probably correct. I picked up the book because of my work on the SharePoint Shepherd Presents DVD series. The goal of the series is to make learning more accessible to people who need it. The series started with some preliminary research on the challenges of getting specific content at a time that was appropriate. I was being asked by customers – who were ready to make a move – when there would be a conference they could attend that would have what they need. Even with the conferences cranked up to full speed it was an average of three months away for someone to get to the conference that would get them the information they wanted and even then there would always be gaps. A conference organizer has to pick and choose with limited slots what content they want to have delivered. All of this lead to the realization that we needed a way for people to get to the information they needed – when they needed it. Trying to put these together into a single context; it’s clear that adult learners need to be trained at the moment in time that they need the learning (readiness), why they need to know a piece of information (need to know), that they have the foundational concepts necessary to integrate the new information (foundation), and that they have an understanding of the problem they are trying to solve (self-concept). The training must be focused on solving problems (orientation) and the motivation for learning must map to the internal motivations of the student (motivation). In addition to the core framework of Andragogy, there are numerous other citings and alternative views presented. The Adult Learner explores why adults choose to learn – to solve a problem, to develop a social network, or for the joy of learning itself – as well as reasons why adults reasonably reject learning. 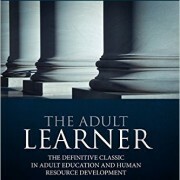 The Adult Learner also explores the tension between Andragogy and the needs of human resource professionals who are charged with training the organization in the key skills it needs to be safe and effective. Andragogy proposes that learners should be in greater control of their learning experience – that they should be self-directed – and yet human resource development would dictate that the organization has certain needs for skills that employees and volunteers must be taught. 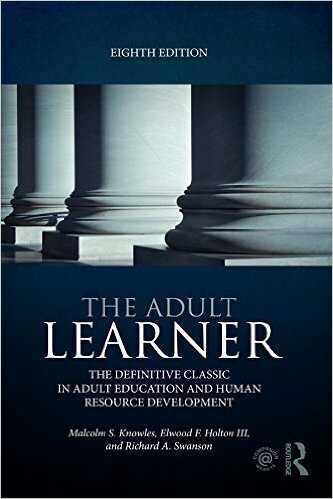 I believe that if you’re trying to teach adults, whether it is as a content or a courseware provider, an instructor, or a learning professional, you should read The Adult Learner.